You are here to stay. Get In Touch With Shoka! 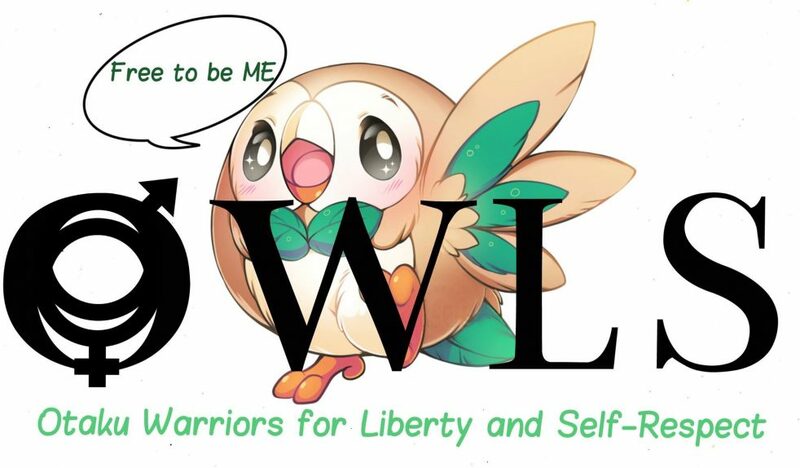 I am back for that obligatory monthly dose of OWLS and much more of what it is. For this month I am still going to do what I’m known to be doing — not sticking to the darn point. With that warning in mind, I’m sure you can already think of reading this post as a mini journey on its own. Well, it actually is because this month’s theme is no other than “journey”. Please do grab Matt‘s hat and look for an awesome post preceding mine. Therefore, the one person I am picking out for this very topic is no other than your favorite airhead—Hirasawa Yui—who is often finding herself lost while just living the heck out of her life and obviously growing up. Oh, yes. The show I am talking about is of course, K-On! and its affiliates. Everyone has something to do—except Yui—who plans to have some nabe. Well I am very aware that I have tackled the one show which repeatedly gets serious, divided views from the audience no matter the generation. I am also going to tell you now that I side with those who went to look past its cute baits and meta slice of life nature, because if anyone has had the patience to last through its entire series, the movie included, they would have known that all of it warranted Yui’s growth as a person, a friend and oh, of course, an older sister! Which makes it more fitting for me to call a journey because let’s agree on this one: she went into her high school, feeling lost even before the first day. She’d even made it to school way too early because of a misunderstanding. 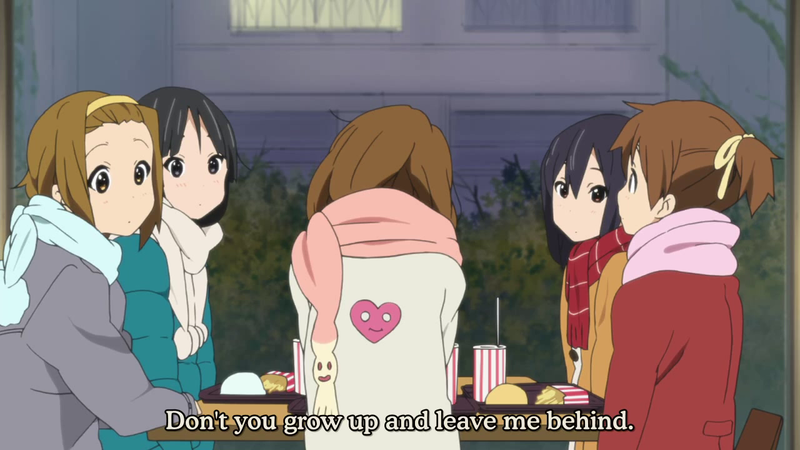 Azunyan acting as the most sane and grownup person in the club, eventually taking over Mio’s role above. Had the show really followed this format for every single episode, there would not really be any kind of progress for any of the characters, let alone for its story. But K-On! really managed to redefine what a slice of life show could be which resulted in possible story progression and more importantly for any slice of life show, character development. While on the subtopic of character development, let us look at Yui and a special formula this show has had for her. The last part is extremely important and is without a doubt in my opinion one of the elements which made K-On! above and beyond most slice of life shows to date. You really do not need aliens coming to wreck the world to prove “heavy obstacles”. In slice of life shows especially, it would have made a lot more sense if these obstacles were something equally frequent in real world, such as forgetting something at home or waking up late. Making Yui an airhead and a klutzy character was fair game, really. Her life skills standard was by all means lower than an average Japanese person and the show made it believable enough. Through these little hiccups, Yui had learned to bear with many kinds of teaching. The first lesson happened as early as the second episode, where she’d learned that nothing good comes for free — it would take sweat and some serious determination to get something meaningful (although I’ll agree on the fact that the reward was somewhat exaggerating). Yui’s journey to growing up was not a solo option; it would have never been possible without her friends in the light music club and Ui, her sister. She was in fact unable to singlehandedly overcome her own issues throughout majority of the show and was helped one way or another by one, a few or all of her acquaintances at once. Now, having to constantly help someone would be really annoying, but in Yui’s case it was more fun than anything because she actually managed to not do the same mistake twice. 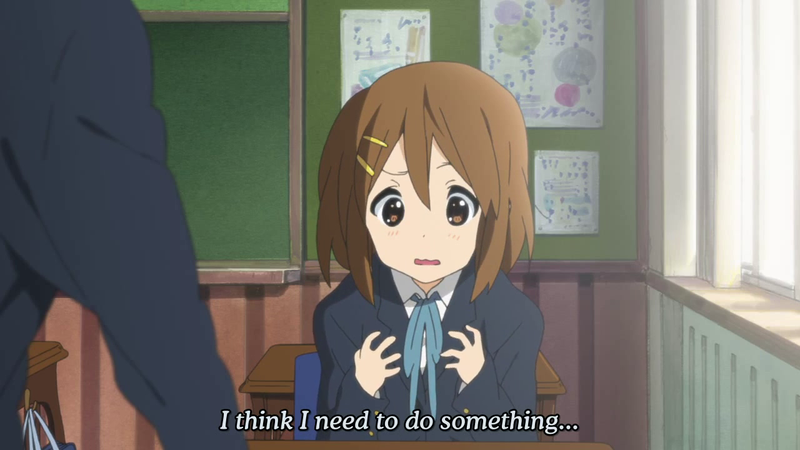 In exception of her laziness, Yui really does not make the same mistake within a short period of time, making K-On! more like your weekly monster flick but switched a monster with something Yui could easily trip on. This being one of them. You can pretty much get what I mean by simply watching the first five minutes of two episodes from the show; the very first episode and second season’s first episode. Tell the difference then. And hopefully by the end of the series’ run, you should ideally feel the same way about Yui as I do now — feeling proud of her journey to growing up from many, many simple slip-ups in life. And that is all of OWLS dose from me this month. After me is a Random Moonid in the Garage! Nothing bad, I can really pinky swear! If anything whatever it is now, I call it good. No, great! Some sacrifices have to be made and I chose to make my blog the most occasional hobby ever instead of cutting ties altogether. That, and the fact that I am now also fully invested in Fate/Grand Order. It is a must play for any Fate fans, yo! Thanks for reading and have a good one! I am not too sure how to describe my current life events in full, but I’ll try and say that I am needed in person more often than behind the screen nowadays. Two types of people: Those who love Slice of Life and those who do not. Whether you do or don’t, it is undeniable that there is a change in Yui from her first episode appearance to the last. Sure you may have to last through potentially 40 episodes of repeat antics but that’s slice of life in a nutshell. This show is definitely not a binge material so do not force yourself to! A lot of us will definitely associate with Yui, not knowing what we are doong most of the time, messing up, goofing around and stuff. And when problems greater than our capabilities arise, somehow, with time or some other means, manage to overcome them. Maybe the same mistake might be made, but probably in a different way, still we learn from the experience and grow up from there. Thanks for this awesome share! They say life is a journey. Yui is literally just showing us that with some entertainment! Such an nice in-depth look at K-ON! and Yui. I could have sworn that I’d only scratched the surface, haha! Pingback: What is a Journey? [OWLS] – . Look at what day it is!